This map tries way too hard to be a convincing city block. With cars, custom textures (rather decent ones), a sewer, stores you can enter, a gas station, and more, it's got all the trappings of a good map. Unfortunately, it's also got 320+ polys in TWO SPOTS, an overall cramped blockiness, so-so flow, buildings that look like boxes with textures slapped on 'em, and lighting that makes me wonder which city had the nuclear holocaust a couple miles away to bathe THIS one in this odd orange glow. For the mapper: Knock your polys down, don't try to jam-pack your maps full of stuff, study the flow of the "greats" of DM maps. You've got an eye for theme, now develop mapping concepts. I like the lay out and the textures (hehe). Only problem is the Poly count. Thus slowing performance even on NASA. 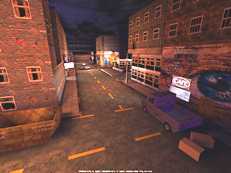 Though the polys are a bit high in places I thought that this is one of the better Urban themed maps. Just the thought of being able to duck into stores,sewers,offices,a movie theater,and a disco were all nice touches. There are unfortuately some bugs w/ the map. But at least check this map out. I'm running a voodoo5,450pIII,and 256mbRam I had no performance prob. to mention (offline). Online I would set up a game for no more than 6 players just to keep the lag down. Check out DM-Dogtown for a slightly bigger, lower light Map. DM-Dogtown has the same feel but with better poly count for smoother performance on older systems. This is the greatest map I have ever seen, can somebody tell me who the author is? I want to talk to him if he can help me with finishing that masterpiece map 8(). OMG!This map kick ***!I like when its possible to open doors and venture throught a wide place!I want more of these maps!! !Download it if you don't care about graphics like I do! I would pay good $$$ for a mappack of 5 or 6 maps just like this one. The only thing i wanna know is why dont mods work in this map?? AWESOME!!! !, just an awesome map. I'd give it an "11" on the awesome meter. This is the best yet for a city map. Especially with the use of the store fronts and the detail inside, plus they give you an escape out of them. And the detail of the cars and the businesses at street level are amazing. Way to go dude!! This is a definate keeper. I think this map is great!! Feels very realistic when playing...Highly recommended!! Borrring, far too cramped, and highly overrated. This map actually is pretty damn good, with a modern rig you should be able to run it without any slowdown at all. The only problem i did notice was the bot nodes aren't very well done. They work but because thier shoddy it really detracts from the level because you find yourself fighting in the same areas and you don't really get to explore the entire level. Everything else works okay though, i'd say give her a try and see if you like.